For the NES conversion, see Gradius II. For the MSX game, see Gradius 2. For the Game Boy game, see Nemesis II. 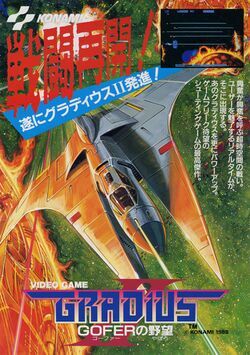 Gradius II: Gofer no Yabou (グラディウスII GOFERの野望, Gradiusu Tsū: Gofā no Yabō?, Gradius II: Gofer's Ambition), known as Vulcan Venture in arcades outside Japan, is a horizontally-scrolling shooter originally released for the arcades in Japan in 1988. It is the sequel to original Gradius and was succeeded by Gradius III: From Legend to Myth. Ports of Gradius II were released for the Famicom (under the shortened title of Gradius II), PC Engine Super CD-ROM², and the Sharp X68000 in Japan. The original arcade version is also included in the Gradius Deluxe Pack compilation for the PlayStation and Sega Saturn and in Gradius Collection for the PlayStation Portable. The player returns as the role of the pilot of the Vic Viper spaceship to battle the second onslaughts of the Bacterion Empire, under the new leadership of Gofer, the giant head. Gradius II has kept the gameplay from the original game, but infused it with enhancements brought from the spin-off, Salamander (Life Force). This is primarily evident in two of the weapons configurations that are selectable. Another first in the series was the inclusion of the "boss rush" (also known as "boss parade" or "boss alley"), a level designed entirely with only boss confrontations. It's the last act of the Second Bacterian War, but the Bacterians are using a new strike force led by a leader named Gofer. Once again, the Vic Viper is Gradius' last hope. This page was last edited on 6 August 2015, at 00:56.